Background: The presence of a discernible brow bone is a classic male forehead feature. The existence of a brow bone break, where the edge of the underlying frontal sinus development stops and the flatter forehead begins, is what separates men from most females. How significant this brow bone break should be in men, which is a reflection of the overall size of the brow bones, is an function of individual aesthetic preference. In larger brow bones that are judged to be excessive or not anesthetically pleasing, a facial appearance is often created of an angry or unhappy individual. Strong brows may be masculine but too strong of a brow is associated with a hypermasculine or ‘Neanderthal’ type appearance. When assessing large brow bones in men the shape of the forehead above must also be considered. Men naturally have a more backward slope to their forehead than women but any backward angulation that is associated with greater than a 10 to 20 degree angle is too much. In the presence of excessive brow bone protrusion, each has a synergistic negative effect. The brow bone protrusion makes the forehead slope look more severe and vice versa. Whether one should correct the slope of the forehead at the same time as a brow bone reduction can be determined preoperatively by computer imaging. Case Study: This middle-aged male had a significant brow bone protrusion that had bothered him since he was young. Skull x-rays shows the degree of brow bone protrusion caused by other pneumatization of the frontal sinus. Computer imaging demonstrated that the simultaneous decrease in is forehead slope, even if just a little, was of aesthetic benefit. 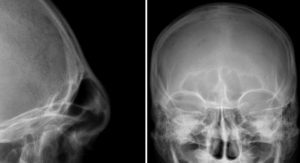 Under general anesthesia and through a coronal scalp incision, the anterior wall of the frontal sinus was removed and the outer edges of the front-nasal junction and supraorbital rims reduced to allow inward repositioning of the reshaped bone flap. The bone flap was stabilized with a small t-shaped plate snd screws.The outer edges of the brow bones, where the frontal sinus did not extend, was also reduced by burring. To simultaneously augment the forehead, PMMA bone cement mixed with antibiotic powder was used to provide a mild buildup of the forehead back across the top of the skull. A distance was maintained between age upper end of the brow bone flap and the lower end of the level of the cement. In every bone flap setback technique used in brow bone reduction there is never a perfect bony seal around all edges of the frontal sinus. This will take time to heal and creates the short-term risk of sinus contamination onto the forehead augmentation material. 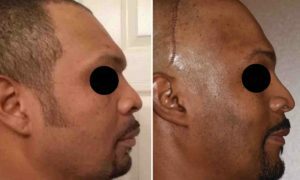 Keeping it separated by a strip of normal frontal bone allows the scalp flap to stick down and create a healed separation between the two, making how well the bone flap heals irrelevant. Simultaneous brow bone reduction with forehead augmentation is a synergistic procedure where each one helps the other to look less excessive. This can be appreciated even at just one day after surgery. 1) Excessive male brow bone protrusion is often accompanied by a significant backward sloped forehead. Each making the other looks worse. 2) The combination of of brow bone reduction by bone flap setback and forehead augmentation provides the most effective total forehead reshaping procedure. 3) When combining forehead augmentation with open brow bone reduction, care must be taken to not encroach the bone cement near an open healing frontal sinus.